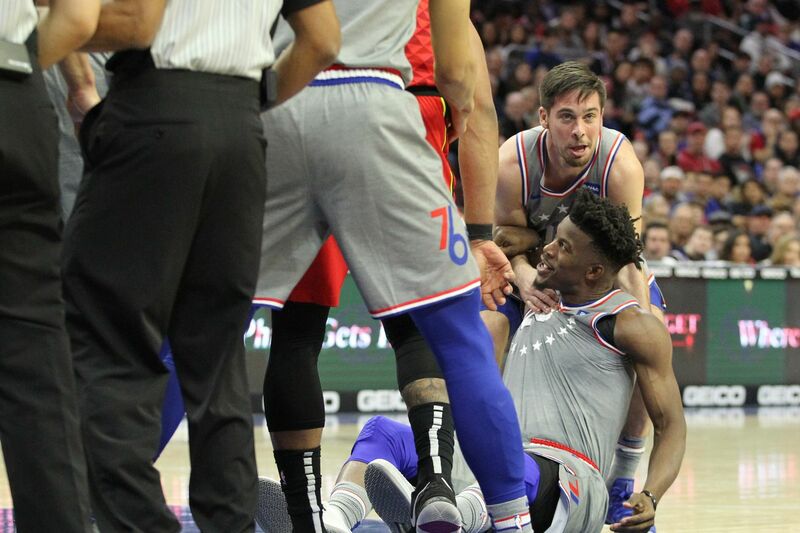 TJ McConnell, top right ,of the Sixers drags teammate Jimmy Butler away from a potential altercation after a flagrant foul by Alex Len of the Hawks in the 2nd half on Jan. 11, 2019. - The Atlanta Hawks play with the high energy the Sixers used to play with in the previous five seasons. A lot of that has to do with first-year coach Lloyd Pierce, who was an assistant in Philly during the time. Like the Sixers, the Hawks have taken on the defensive-minded coach’s personality. It’s obvious that the Sixers miss him. - Brett Brown could be right about Joel Embiid deserving to win the defensive player of the year award. That’s because, without him playing Friday, the Sixers defense was a wreck. Just like it was in the last game he missed, a 34-point loss to the Portland Trail Blazers on Dec. 30. - The Sixers roster, as it is currently constructed, will have a tough time getting a Top 4 seed in the Eastern Conference playoffs. And if their defense doesn’t improve, the Sixers may have to fight to hold off squads for the fifth spot. - Ben Simmons is still able have an impact on games while playing power forward and center. He saw a lot of action down low against the Hawks and recorded his seventh triple-double. Best performance: This goes to Kevin Huerter for scoring a career-high 29 points while 5 of 8 three-pointers. The Hawks rookie shooting guard scored 21 of his points after intermission. Worst performance: I had to give this to Wilson Chandler. The Sixers power forward finished with five points while missing seven of his eight shot attempts. He graded out with a game-worst minus-14. Best defensive performance: Alex Len gets this one. The Hawks reserve center had a game-high two blocked shots. Worst statistic: I gave this to the Hawks’ 21 turnovers. Best statistic: The Hawks’ three-point shooting (48 percent). Worst of the worst: The Sixers' non-existent defense. The Hawks were able to do whatever they wanted to do to the Sixers.